Did you see the fantastic stamp clusters Lindsay Jane posted at her blog(http://lindsayjanedesigns.blogspot.com/)? They were just perfect for some photos I took at Floriade a few years ago when I was living in Canberra. I loved floriade, every week the display would have changed depending on which flowers were blooming. Every time I went I would come back with literally hundreds of photos. The flowers were just over whelming, so much colour. 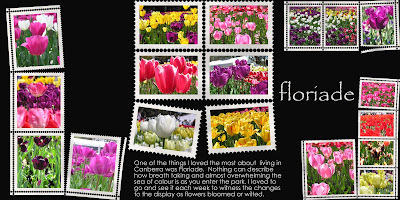 The stamp clusters were perfect because the scenes of floriade would easily make a stamp set. I am so appreciative of the talented designers like Lindsay Jane who generously share their work. Especially items like this that make it easy to capture those memories and cut through that backlog. Your page is very striking! I love the vivid colors against the bold black background and the crisp white frames.